For the first time since the introduction of carrier billing in AppWorld, the percentage of users making use of carrier billing was down from the previous month. 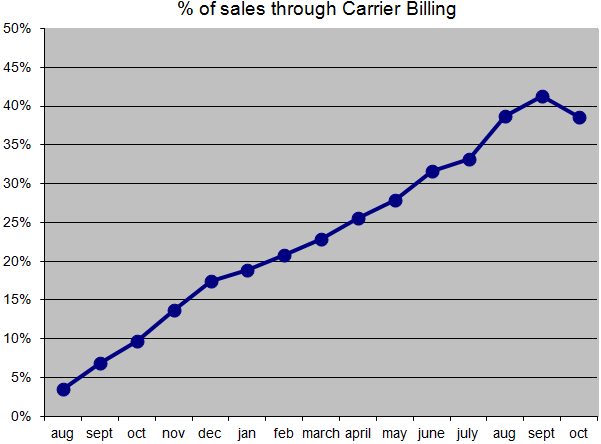 For the month of October, carrier billing accounted for 38.6% of all purchases. In the United States 72.7% of all AT&T and T-Mobile customers choose to purchase their apps via carrier billing. This number is larger then the 38.6% of all purchases due to the many carrier that still do not support this option. This data is generated from the dollar amount of purchases of all Ebscer applications over the given months.